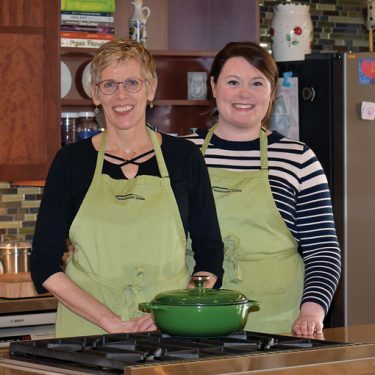 In the Leishman Center we emphasize cooking with the seasons while also encouraging freezing or canning seasonal fruits for winter enjoyment. Fruit crisps are a great way to use these delicious fruits. Crisps are quick to prepare and great to satisfy the after dinner sweet craving while suitable for breakfast or snacks. We developed this simple blueprint to create crisps all year long. in the crumbly topping. During the summer season try whole wheat pastry flour, oats, slivered almonds, cinnamon, ginger, butter and brown sugar and use peaches or blueberries with cinnamon and orange zest for the filling. 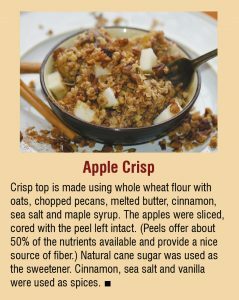 When you’re making a crisp top in the fall use whole wheat flour, oats, walnuts, cinnamon, butter and maple syrup. For the filling use apples, lemon juice, honey and cinnamon. To assemble, combine all ingredients. Prepare fruit as directed. If frozen, use from frozen state. Mix with sweetener, spices, salt and vanilla. Mix well. If fruit is very juicy stir in 1 tablespoon tapioca or arrowroot powder. Pour fruit into lightly oiled 8 x 8 pan. Crumble topping evenly over the fruit mixture. Bake 40 minutes until fruit is tender and topping is browned.